Notes: Buzzers is an English term for midges. They represent Chironomids that are a significant food source for many fish, particularly within stillwaters. The TDC pattern was one of the first emerging midge patterns designed on our West Coast in the 1950's and the Zebra midge followed soon as a thread body pupa and larvae pattern. 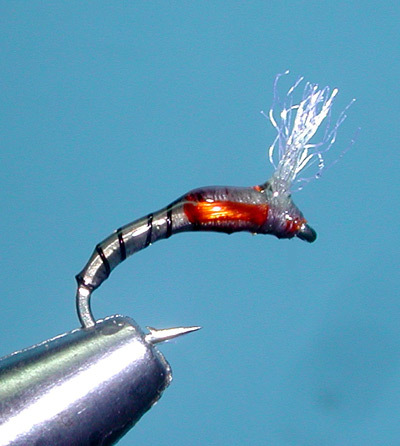 Buzzer patterns were developed within England starting in the 1920's with the Blagdon Buzzer created by Dr. H A Bell. The Epoxy Buzzers were also developed in Great Britain, eventually coming to our West Coast as well. 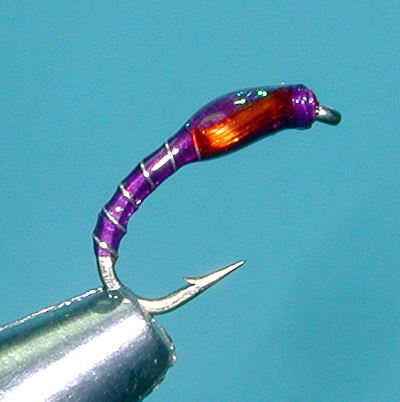 Bob Wyatt (Trout Hunting:The Pursuit of Happiness, 2004) indicates that Ron "The Pub" Oldroyd in England may have come up with the pattern using a thread body with a Pearl Mylar ribbing and a Pearl Mylar thorax. Keeping the pattern slender with the minimal amount of material, Ron covered the body with Epoxy to protect the material and also provide a realistic glassy body. Epoxy takes some time to harden and has associated fumes that must allow some time to cure. If the coating was to be slim, an acrylic coating such as Sally's Hard as Nails would often be substituted. Today, there are UV cured products that produce the same effects as Epoxy and are much easier to apply as well as curing within minutes. 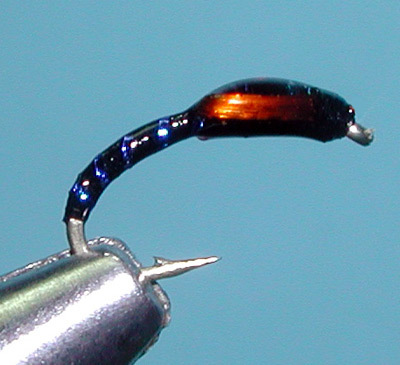 With these new finishes, Epoxy Buzzers have become much more popular and are used often within our Sierran waters. 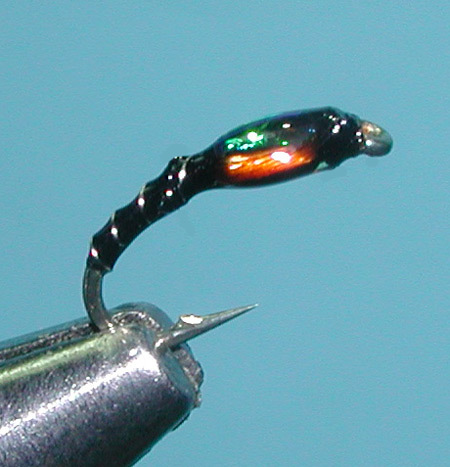 The thin profile allows the pattern to work well as a multiple fly nymph rig due to the excellent sinking rate. 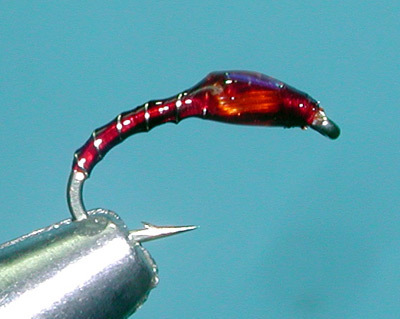 It is also a good choice for a dropper from a dry fly. 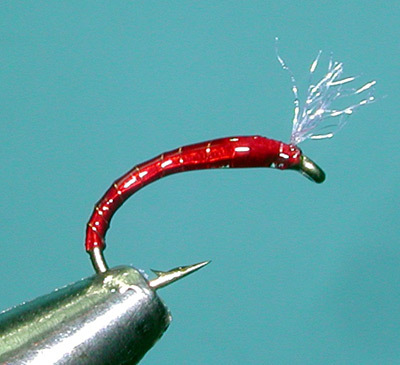 Within stillwater applications, trout might shy away from traditional beadhead patterns but will readily take an Epoxy Buzzer. 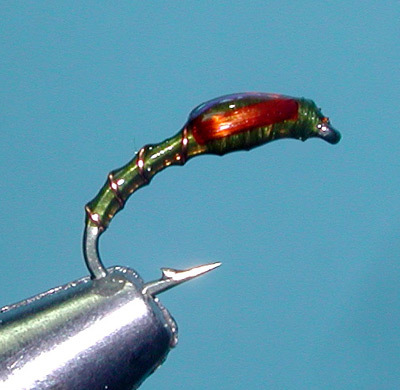 The Epoxy Buzzer is often composed of a thread or floss body with a ribbing. The thorax is usually thread with orange colored cheeks and a small thread head. Some patterns tie a tuft of antron just in front of the head for gills. The entire body is covered with Epoxy with a small build-up of epoxy around the thorax for a smooth and sleek profile.